In the case of a male child, her normal period of uncleanness, seven days, preceded the circumcision on the eighth day. She would then persist thirty-three days until she could present her offering. (The doubling of this period for a female child is outside the scope of this study, though it is worth noting that such distinctions between male and female exist elsewhere in Scripture.) Once the period of her cleansing ended, she presented a lamb and a bird as a sin offering in order to make atonement. The Law also mercifully allows for the substitution of two birds in the case of poverty, which was the case for Mary when she presented Jesus at the temple. Given the seven day period, if the eighth day is part of the thirty-three, this event occurs forty days after the birth of Christ. Because Jesus was Mary’s firstborn son, Luke also includes a note regarding the unique character of such a child. During the original Passover, the Lord struck down the firstborn of Egypt (Exodus 12:29-30). In so doing, He redeemed the firstborn of Israel, giving Egypt as their ransom (Isaiah 43:3; Numbers 3:13; 8:17). Therefore, from that point forward, the firstborn was uniquely consecrated to the Lord (Exodus 13:2, 12, 15). However, because of the sin of Israel with the golden calf and the faithfulness of Levi on that day (Exodus 32:26), the Levites were substituted for the firstborn in general (Numbers 3:40-51). It may be, therefore, that Luke means to identify Jesus not only as the firstborn of Israel in this way, but also as the Levite par excellance, being our great High Priest. 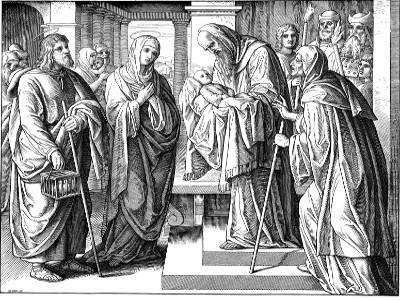 During the purification of Mary, Simeon sees the Lord’s Christ and blesses the Lord with a unique song of thanksgiving. Mary’s song in Luke 1:46-55 finds some parallels with the song of Hannah in 1 Samuel 2:1-10, and Zechariah’s song in Luke 1:68-79, emphasizing the Lord’s faithfulness and redemption, finds many parallels in the Old Testament (such as Exodus 15). However, since Simeon saw with his own eyes the promised consolation of Israel, his song has no real parallel. Here was the promised salvation! Here was the light of revelation to the Gentiles! Here was the glory of Israel! How many eyes longed to see what he saw, yet did not see it (Matthew 13:17)! But Simeon also recognizes that this Christ will also be a stumbling block to Israel. Since Israel according to the flesh sought a righteousness based on works (Romans 9:32), the coming of Christ would reveal their distortion of the Law for what it was. Simeon therefore not only anticipates the continual struggle between hard hearted Israel and Christ, but also that they would crucify the Lord of Glory, even to the point of denying the plain reality of the resurrection with the least ridiculous lie they could get away with (Matthew 28:13). Anna here seems to appear as a second witness to Christ, suggesting the twofold testimony required for establishing a claim (though usually stated negatively as a charge for a crime, such as Deuteronomy 17:6, 19:15). Her descent from Asher is unique, since Asher never usually features prominently in the Old Testament. The second son of Zilpah, Asher means something like “happy” (Genesis 30:13). Jacob and Moses both bless Asher with richness and favor (Genesis 49:20; Deuteronomy 33:24). However, Asher failed to fulfill the conquest of Canaan (Judges 1:31-32), leading them to be grouped into the Northern Kingdom with Ephraim and exposing them to all kinds of idolatry and apostasy. However, in the days of Hezekiah, some of the tribe of Asher “humbled themselves and came to Jerusalem” (2 Chronicles 30:11), because there were still some who held to the Lord. Thus, happy indeed this faithful daughter of Asher who saw the redemption of Jerusalem! 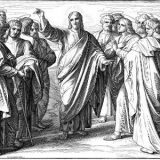 Finally, Luke’s purpose in relating this event is to emphasize that Christ fulfilled the Law of the Lord, even when He had to rely on His mother and Joseph to do so! For “when they had performed everything according to the Law of the Lord, they returned into Galilee” (Luke 2:39). After this event, Jesus would begin to fulfill the Law Himself, but Mary feared the Lord and kept the Law regarding her purification. 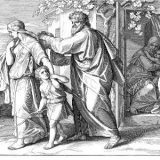 It was, of course, Christ’s own righteousness at work, even in the purification of Mary, for the uncircumcised child was guilty of breaking the covenant (Genesis 17:14). Infancy was not a valid defense in this case, even if it happened because of the negligence, willful or otherwise, of someone else. However, Christ, in the hands of Mary and Joseph, kept the Law even from birth, so as to be the perfect substitute.